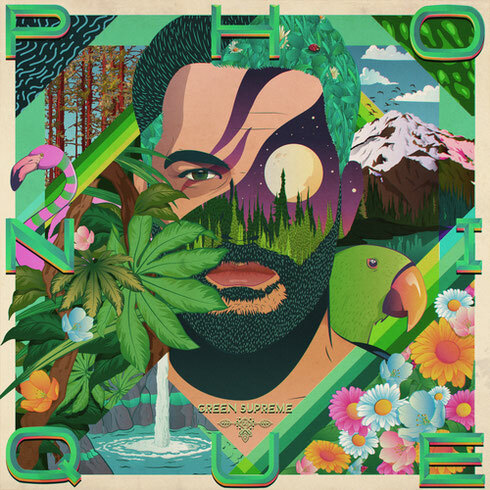 Released February 2017 on his own Ladies and Gentlemen imprint, ‘Green Supreme’ is the fourth studio album from house music veteran Phonique, a collection of 11 songs. To date, Phonique has amassed a discography of more than 500 original tracks and remixes – as well as three previous studio albums – for labels such as Dessous, Poker Flat, Crosstown Rebels, Systematic, Souvenir and his own label Ladies and Gentlemen, a collection which includes some apparent runaway successes. The 2010 track ‘Feel What You Want,’ taken from his second album ‘Kissing Strangers’ currently has over 36 million views on YouTube, while the 2012 track ‘Vincent Price’ currently sits at the 11 million mark, making Phonique one of the very few underground producers whose music has the ability to cross into the mainstream. Despite working on Green Supreme, his production rate has continued unabated in 2016, with highlights including ‘T Groove’ on Katermukke and his remix of Frank & Friedrich 'Coming Home' which landed on Universal earlier this year. His three previous albums attest to his evolving sound and influences, his knowledge of house music, and attention to detail, all of which are further established with ‘Green Supreme’, arguably his most diverse and polished album to date. Throughout his career, Phonique has worked with vocalists, a theme that continues with this collection. Tracks include the deep tech of ‘Something To Remember’, on which Stee Downes delivers a vocal, and ‘Taking A Chance’, a melancholic deep house cut complete with sweeping synths and half-caught vocal samples. “This is my most focussed album by far,” say Phonique of the project. “An album should be a pleasure to listen to, even in five, ten, 20 years, so it can’t just be a club beats for 60 minutes. I need vocals, warm melodies and stories. ‘Greene Supreme is out 24 February 2017 on Ladies and Gentlemen.